For the first time in a couple years, at least (or so it seems), our March hasn’t been filled with brow-beating tasks. That’s to say each year past in the early Spring we’ve had things to build, either garden beds or net cages. Or, the weather had been so snowy/cold that getting outside until late April wasn’t even an option. This year, however, we’ve nothing to build and the weather has been unseasonably warm. Rainy, yes; but warm, still. Okay, so we haven’t been that lazy. Even though we don’t have to lug stones and soil between the store and our house this year (though we do have a raised bed to replace), there’s still plenty to do. This past weekend, we took advantage of a stretch of non-rainy days to get outside and do some cleanup. And we made a few discoveries along the way! 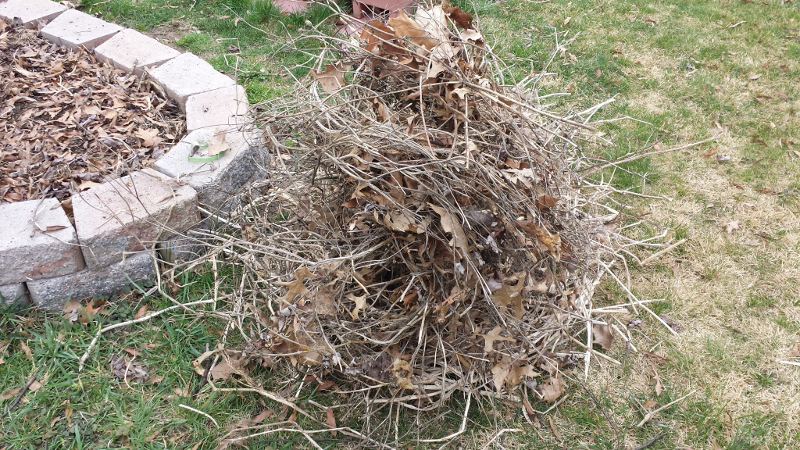 The first task was to remove debris, such as old plant stalks and sticks, from the stone and raised beds. At the end of last year we decided to compost most of the dying plants in place. A lot of them broke down pretty well over the winter, but a lot didn’t. So everything that didn’t had to go. Also at the end of last year we covered all the beds with leaves that we had raked up in the yard. Our usual plan would then be to remove the leaves from the beds sometime in April in order to add new soil. But this year we’ve decided to keep the leaves on and simply uncover or make planting regions when we’re ready to plant. (Plus, the soil underneath is in fantastic shape — very dark and rich.) The hope is that the leaves will help keep weeds under control over the course of the summer. Considering how pervasive weeds are in our yard, it should be an interesting experiment. As we worked on removing debris, we uncovered a couple surprises. First is no surprise at all, but we have what we’re pretty sure are tomatoes coming up e-v-e-r-y-w-h-e-r-e! Found these seedlings in one of the lettuce beds. 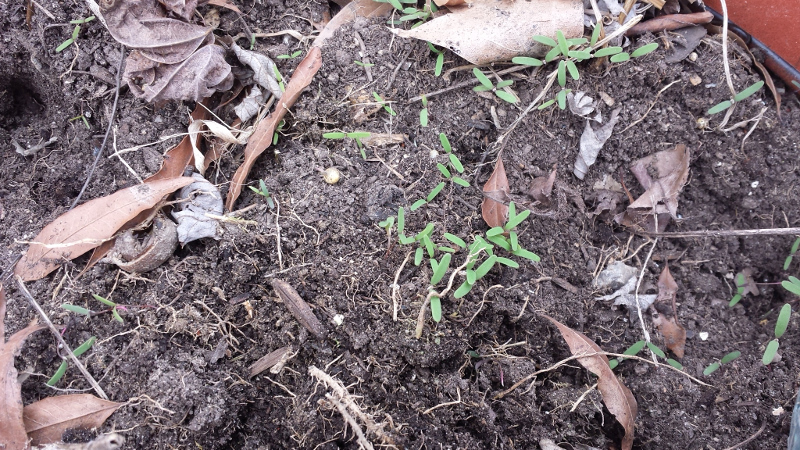 Last year we mistakenly thought these same seedlings in one of the beds were marigolds, but nope…we ended up with the “tomato jungle.” This year, these exact same seedlings are popping up all over the place. They are definitely in most of the places where we planted tomatoes, and they are in some places were we didn’t and don’t plan on planting tomatoes this year. Considering that we already have a tray full of tomato seedlings indoors, we’re going to have to make some tough choices…like, tilling in most of the volunteer seedlings. It’s an unfortunate option, but we also want to grow other things besides tomatoes. Go figure, right? In other discovery news, it seems that a few bunches of kale are alive and well! Have to find out if it tastes like anything. 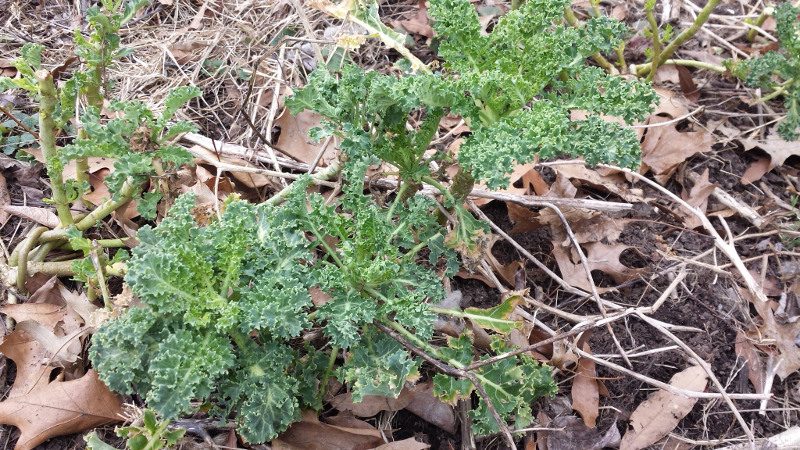 Late last year, we left a few kale stalks out with the intention of making a winter harvest or two. Unfortunately, the rabbits and squirrels got to them before we could, leaving mere stumps in their wake. Eventually the winter snows arrived, and we kind of forgot that the kale was there. Upon cleaning we found that the kale was making quite a comeback, with bunches of deeply curled and beautiful leaves sprouting from what we thought were dead stalks. We’ve not tried this kale, Blue Curled Scotch, in it’s “baby” form, and now we can! Tasty or tasteless? We’ll let you know. 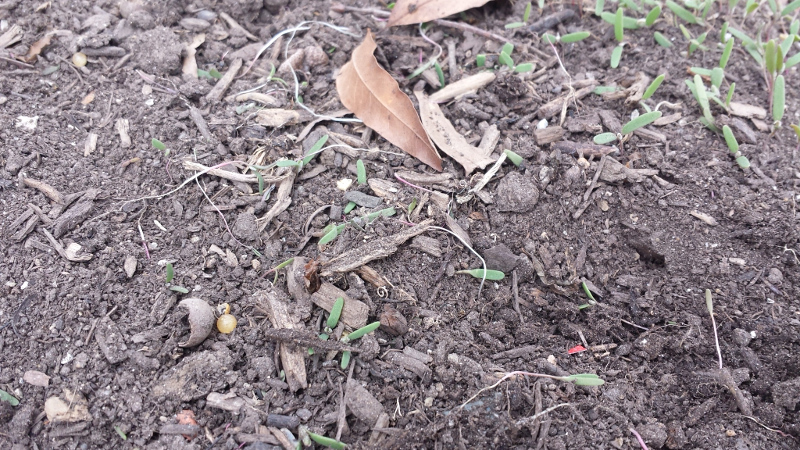 In addition, we found all sort of vegetative remnants, from seed pods to tomato skins, scattered about. 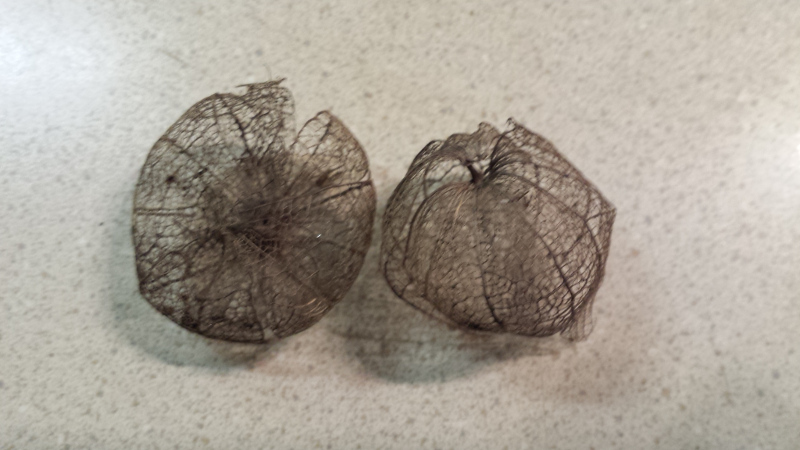 Among the most visually striking were the in tact, skeletal remains of tomatillo husks. All in all, while we’ve got a non-lazy Spring ahead, it’s not going to be backbreaking like previous ones, and that is most welcome! Previous Article Holy Rapid Growth, Batman! Just be careful of the bad weather that is suppose to be on its way. Thankfully, we seemed to have escaped the brunt of it. Though we did end up with an icy, messy backyard. No early planting…not yet anyway.